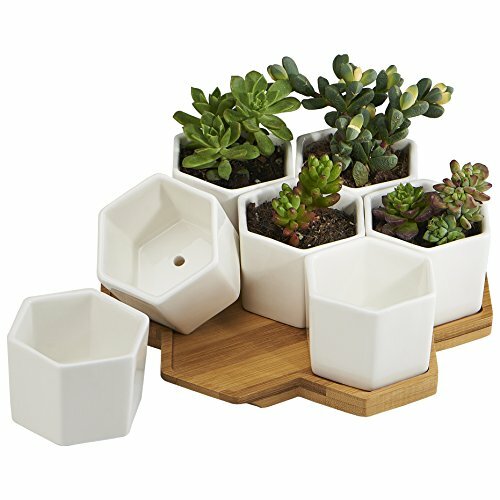 4 ) This set includes 7pc white hex high temperature made ceramics flower pots, 1 pc bamboo base, ideal for decorating desks, book shelves, tables, window sills, living room, outside gardening etc. 7 ) Small modern hex decorative cute jars with saucer can also be used for small mini home desk ornaments kits funny container or organizer for your self, wife, husband, men, women, family. 9 ) 7pcs gardening vases, come with bamboo saucers to hold the water and soil, always keep clean and natural design to decor your home. 1 ) HIGH TEMPERATURE CERAMIC - High temperature ceramic to make sure the most stable, strongest and durable quality, the high temp ceramic has high density to avoid water infiltrate to the pots to cause color change. Stronger and more durable and stable than regular ceramic pots which are made of middle or low temperature ceramic. More easy to store and clean. 3 ) SMALL AND PERFECTLY FORMED - Each Pot 2 x 2.75 x 2.75 in. Bamboo Tray - 8.25 x 0.5 x 8 in.., The sleek white ceramic and hexagonal shape of these plant pots provide modern, geometric style, and features a drainage hole and bamboo tray.